Rise and shine! Eddy is up and out for 6am, Monday to Friday to be at the office for 6:30am sharp. Eddy doesn’t mind the early starts as much in summer, with the sun soaring for the duration of his day. It’s brew haven in the office, with all 20 drivers queueing up for the kettle to warm their cockles before they set out on the road. Each driver is given their allocation for the day from our super organised coordinator, which usually entails on average, 9-10 deliveries a day in summer and around 15 in winter. Summer is a breeze for our drivers compared to winter. Bad weather hinders travel and makes access to remote buildings a challenge, not to mention it being freezing cold when having to hop in and out of the trucker in arctic conditions! But winter is our busiest time. With home heating oil, kerosene and red diesel some of our most popular products out for delivery. Our drivers have to ensure the right amount of fuel is put into their tanker for the day, which takes around 30 minutes. After filling up with burning oil, red diesel and gas oil, Eddy sets out on the road, just before 7am to get a head start before the traffic builds up. Today is a relatively easy job, with most deliveries reasonably close together and around the area of Burnley. First stop is a factory on an industrial park. This is a familiar place for Eddy, as he delivers 1000 litres of red diesel twice a week to generate their forklifts and machinery. 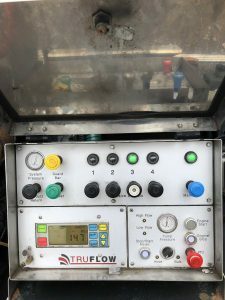 To complete the job, Eddy unwinds the hose from the tanker and connects it to the storage tank. He then heads to the controls on the side of the tanker and inputs the required volume of kero. Whilst filling up, all drivers must observe the transfer and check the tank level to ensure there are no mishaps. Most tanks have an emergency cut off valve to avoid spills or leaks, but it’s still important to monitor the process. Once complete, Eddy prints off the receipt for the amount of red diesel supplied and gives it to whoever’s on site. Luckily, the next three morning deliveries are also close by on the estate. Winner! Eddy repeats a similar process, with all three customers requiring red diesel. One site’s fuel tank is hidden round the side of a building, so it takes some good strength to ween the hose right round. Several deliveries later and 12 ‘o’ clock hits. It’s time for a pitstop. It’s actually required by law for drivers to take rest stops. Eddy parks up at the back of a Tesco and heads in for some well-deserved lunch. All of our drivers keep in touch throughout the day via our internal telecom system, as being out on the road can get a little lonely sometimes, especially in winter. Drivers often pick up jobs for each other if someone’s delayed and another has managed to complete their deliveries ahead of time. Half an hour later, and Eddy’s on the road again. Next stop, a house way up in the hills. The tanker winds round the country roads to eventually (after a few tight squeezes) reach a house that’s off the grid. Eddy drives one of our smaller tankers so he’s able to access those hard to reach areas. The views are something else in summer so it’s not all that bad! This delivery is for 1000 litres of kerosene which is used to heat the entire house for around 6 months, so Eddy only visits twice a year. This customer is smart and is getting ahead of the winter rush. By ordering in the summer months, you will beat the competitive prices and be guaranteed a delivery without delay. Eddy follows the same process of unwinding the hose and attaching it to the fuel tank. This one’s easy to access, so it only takes around 15 minutes to fill up. Eddy then disconnects the hose and hoists it back onto the tanker. You’ve definitely got to have some good muscles! ✓Is your home easy to find? ✓Is your tank easy to access? ✓Can a trucker get down to deliver? If you answered ‘no’ to any of those questions, be sure to let the company know of any useful information that may prevent a delivery being hindered. We have tankers of all sizes, all over the UK, to enable us to meet all of our customer’s needs. 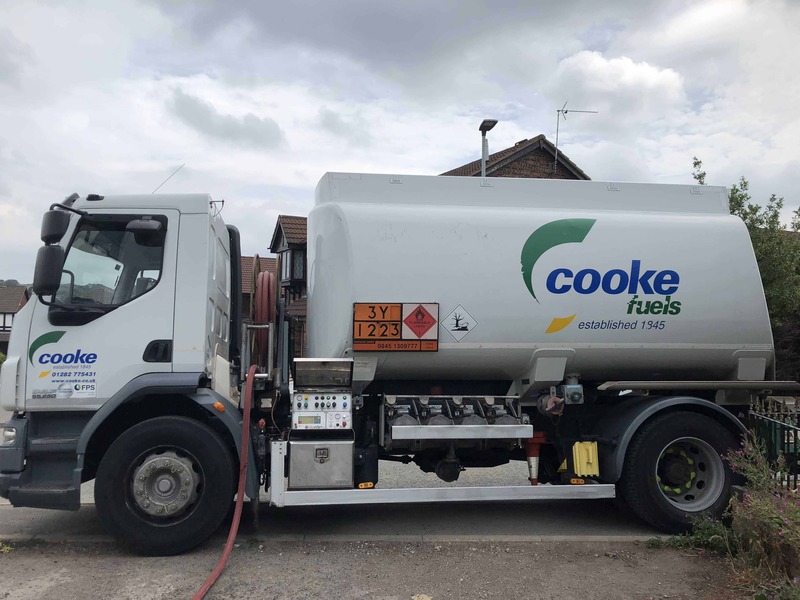 Our larger tankers are suitable for large bulk deliveries from 500 litres to 36,000 litres (or more) and save our customers time money in the long run! Following 3 more visits, one to a furniture manufacturer and another to a customer who requires DERV to power their delivery vehicles, Eddy heads to his final job, a paper factory. This job is more dangerous and requires Eddy to put his hard hat on for the duration of the visit. He has to report into reception so they know who’s on site at all times. Upon completion, our driver then signs back out and heads back to the Oil Centre for around 3pm. Eddy finishes his day by emptying his tanker of any leftover fuel and parks it up ready for a new day. Home time for a well-deserved afternoon nap! If you’re looking for a reliable delivery of fuel, we have tankers of all sizes, ready to deliver your red diesel, DERV, kerosene, heating oil and more. If you’d like to place an order, speak directly to an adviser by calling 01282 775431.